December 23, 2013 DOHA: Noted Doha-based Islamic scholar Dr Yousuf Al Qaradawi, a known supporter of the Muslim Brotherhood in Egypt, said he had no relations with the organisation and he differed with it on many issues. ‘My relations (with the Brotherhood) ended 20 years ago and I am now working for the whole Muslim world,’ said Al Qaradawi, in an interview with Al Watan daily, when asked if he had any ties with Muslim Brotherhood’s international wing. ‘I would differ with them in a number of issues. In the first round of the presidential elections in Egypt I supported Abdul Monem Abu Al Futooh (a former Brotherhood member) although the Brotherhood was against him. I supported Mohammed Mursi in the second round because Ahmed Shafik was his opponent, who represented a continuation of the Mubarak rule,’ he added. Youssef Qaradawi is the most important leader of the Global Muslim Brotherhood and is the de facto spiritual leader of the movement. He is also considered to be the “spiritual guide” for Hamas and his fatwas in support of suicide bombings against Israeli citizens were utilized by Hamas to justify their operations. In 2004, Qaradawi turned down the offer to head he Egyptian Brotherhood after the death of the Supreme Guide. He is based in Qatar and has said the Qatari Emir has protected from being designated as a terrorist by the U.S. He has also reportedly amassed substantial wealth by serving as the Shari’ah adviser to many important Islamic banks and funds. 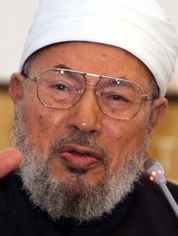 Qaradawi is the head of the Union of Good (UOG), a worldwide coalition of charities helping to raise funds for Hamas and is the leader of the European Council for Fatwa and Research (ECFR), the theological body of the European Muslim Brotherhood. MEMRI has produced two video compilations of Qaradawi’s extremist statements. The first collection contains Qaradawi’s statements about Europe and the US as well as about Israel and Jews. The second collection contains various statements by Qaradawi on social issues such as discussing the killing of homosexuals and stating that beating is “suitable” for some wives. Qaradawi been banned from entering the US since 1999 and UK since 2008. Last year, authorities also refused him entry into France. Last September, the GMBDW reported that Egypt’s chief prosecutor had issued an arrest warrant for Qaradawi who was accused of inciting the killing of Egyptian security forces and meddling in the country’s affairs. The same report also noted that Qaradawi was asked to leave Kuwait as a result of were been described as “divisive remarks he has made inciting violence and bloodshed.